Not particularly a game for the purists but we are at the stage of the season where it is the result that counts and not particularly how the result was achieved. North End took all three points, and the bragging rights, with an early Daniel Johnson effort after great work on the right by Lukas Nmecha. Blackburn will no doubt say the had the majority of the ball in the game and few would argue with that but their lack of quality in the final third and their obvious nervousness throughout the game meant that North End never really looked in danger. Our defence was solid when it had to be and if there are two better young centre halves in the division than Ben Davies and Jordan Storey then I have yet to see them. One down side was the late sending off of Darnell Fisher but all in all a job well done. North End started the game with just one change to the side that drew with Bristol City and that was Lukas Nmecha coming in for the injured Brad Potts. 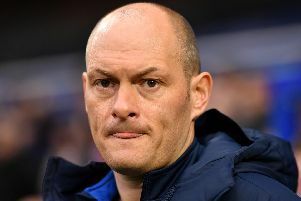 North End started the game with a 4-1-4-1 formation with manager, Alex Neil, happy to play Ryan Ledson in the holding role behind the four man midfield. Ledson was involved in the goal as he played the ball out to Nmecha on the right and the Manchester City loanee went past Williams like he was standing still. A peach of a ball in found Daniel Johnson unmarked and the midfielder hit a sweet shot into the roof of the net to give North End an early lead. Rovers were more direct in their play and although the ball flashed across the box once or twice, Rudd had only one serious save to make in the first half and that was a header from Danny Graham. After the break Blackburn became even more direct but Davies and Storey were sweeping up everything before them. Gally had a shot saved down at the other end as North End were still creating chances and growing in confidence as the game wore on. Alan Browne had a goal bound effort deflected to safety from a defender as North End looked for the second goal that would clearly have closed out the game. Rudd then became the hero with ten minutes to go when a shot was deflected by Ledson and looked goalbound until Rudd made a superb one handed save to clear the danger. In the last minutes of the game Darnell Fisher received a second yellow card and North End had to see the game out with only 10 men which they did without too many problems. Twenty two points from the last 10 games is a fantastic return at any level with North End now having won five away games on the trot. This was not the prettiest game I have seen this season but, backed by an superb following of 7,514, North End did what they had to do after scoring the early goal and saw off everything that Rovers could throw at them. We are slowly but surely creeping towards the play offs and up to now have managed to stay off the radar but if we can get something at Middlesbrough on Wednesday evening and beat Birmingham next Saturday then I think we are in with a real shout of being play off candidates. A few games ago I thought we had way too much to do but one look at the league table may suggest that this season is still very much alive.